New developments and technology are constantly on the horizon in every industry. That’s why it’s vital that small businesses make a consistent effort to learn about new methods, ideas, products, developing customer pain points, and more to maintain relevance in their ever-changing markets. Staying up to date in today’s ffast-pacedconsumer market isn’t easy but being knowledgeable about these trends will help you maintain a competitive edge in your market, position your business strategically for new opportunities as well as helping you to stay credible, relevant and a value to your customers. Here are some of our recommendations to help you keep up with industry trends in your market. Your competitors are a great place to start when researching trends and new developments in your industry. Pay attention to the websites of each of your competitors. Look at the services they are offering and compare them to yours. Are they answering a need or pain point that you are not? Why or why not? This could provide some helpful clues regarding what your customers need and what they don’t need. Also take a look at any business news they mention and any blog posts they may have included on their websites. Look especially at feedback comments from their customers. This will help you keep a pulse on what new trends your competitors are exploring as well as the reception and feedback from customers in your market. Another thing we recommend you do is sign up to your competitors’ newsletters. So you can keep an eye on what trends they are utilizing in the long run. Don’t stop at their website. There are other places you can look as well to keep a close eye on industry trends. Check to see what other websites your competitors are on. Do a basic search for the names of your competitors and see what other websites are featuring them. You might find new directories and listings that maybe your business hasn’t been included on yet. You might also find other blogs they have appeared on which will give you ideas on how you can be featured as well. Another thing you might come across is their previous media appearances if any. This can provide a few clues such as new ways you can use the media to position your business or product, new ideas on how to become an authoritative source of knowledge in your community for the media to seek out, as well as new media contacts you can reach out to in the future. Keeping a pulse on what’s trending in your industry can also be done by monitoring search engines. You can easily do a search using keywords associated with your industry. Your search will yield the latest news about that topic. Searches of this nature can be done on your own business name, your competitor’s names, and any other keywords you can think of associated with your industry. You can even set up an automatic alert notification so that every time something new pops up online about a certain topic you will be notified. The other area you should monitor is social media. Social media can provide a wealth of information about what’s trending in your industry as well as what your customers are saying about it. Check out the business pages of your competitors on all platforms with a special attention to what their customers are saying. Customers are asking questions, saying what they liked about something, or what they didn’t like, complaining, praising, and saying many things you probably should be aware of. This can help you identify new opportunities, new trends, and can even inspire you to come up with your own innovations. 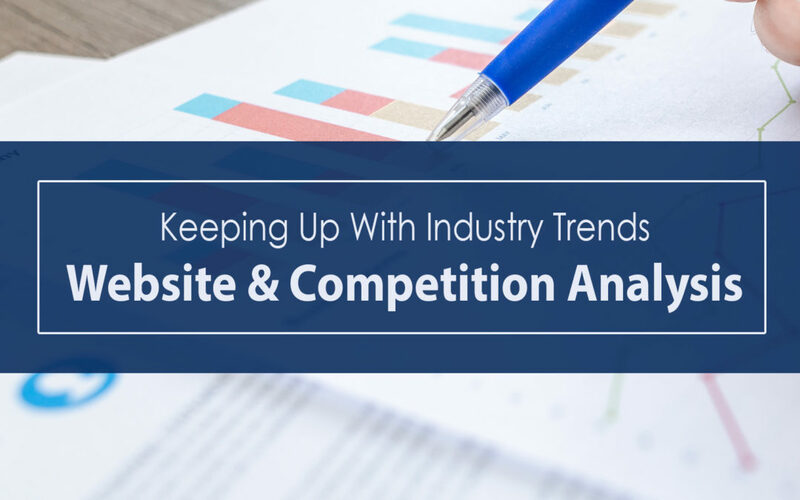 Although it can take some time and a little digging, you should carve out time each week to researching industry trends and to keep an eye on your competitors. Pursuing these strategies will help you stay on the leading edge of your industry.